Black Panther | Outfits - Do You Speak Gossip?Do You Speak Gossip? Last week, I received a new pair of black skinny jeans via mail, and I couldn’t think of a better way to wear them for the first time, than in a total black outfit. I know, most people would have worn them with something more colorful, but if something gets on my mind, it’s really difficult to get it off it. So total black it is, for their first outing. You rarely get to see me in such dark monochromatic looks, but I figured, that my copper red hair is all the pop of color I need some days. Let’s ignore the fact that they’re in desperate need of some hair dye. In fact, that’s exactly what I’m doing, by covering my dark roots with my beanie. Thank God for them! They can easily save a bad hair day, or what needs to be covered in between hair salon visits. hehe So, meet the black panther in me, and get ready for a picture loaded post. Την προηγούμενη εβδομάδα, παρέλαβα το νέο μου skinny jean που παρήγγειλα από το spartoo.gr, και δεν μπορούσα να σκεφτώ καλύτερο τρόπο να το φορέσω για πρώτη φορά, από ένα total black look. Ξέρω ότι οι περισσότεροι θα το συνδύαζαν με περισσότερο χρώμα, αλλά αν κάτι μου μπει στο μυαλό, είναι πολύ δύσκολο να φύγει αν δεν το πραγματοποιήσω. Έτσι, επέλεξα ένα κατάμαυρο σύνολο για την πρώτη του έξοδο. Σπάνια με βλέπετε με τόσο σκούρα μονόχρωμα σύνολα, αλλά σκέφτηκα ότι τα χάλκινα μαλλιά μου αρκούν από μόνα τους μερικές φορές για την απαραίτητη δόση χρώματος. Ας αγνοήσουμε το γεγονός ότι ζητούν απεγνωσμένα να ανανεώσω το χρώμα τους. Στην πραγματικότητα, κάνω ακριβώς αυτό, κρύβοντας τη σκούρη ρίζα μου, κάτω από το σκουφάκι. Να’ναι καλά τα σκουφάκια λοιπόν, που μας σώζουν τις μέρες που δεν στρώνει το μαλλί, ή απλά τις μέρες πριν την απαραίτητη επίσκεψή μας στο κομμωτήριο. Χιχι Να σας γνωρίσω λοιπόν το μαύρο πάνθηρα που κρύβεται μέσα μου, και να σας προετοιμάσω για αυτό το –γεμάτο από φωτογραφίες- ποστ. Πόσο σου πάει το skinny jeans δε λέγεται 🙂 Λατρεμένο total black!! Πωπω! Ποοοολύ φωτογραφικό υλικό!!! Και η μία λήψη καλύτερη από την άλλη! Ειλικρινά, δε με ενόχλησε καθόλου η dark μονοχρωμία σου! Ίσα-ίσα, ΤΗ ΛΑΤΡΕΥΩ! S’euxaristw para poli gia ta kala sou logia! Eh eprepe na girisw sta fisiologika mou kila, persi to eixa parakanei, kai ksefiga ligaki. Twra epestrepsa sta kila pou imoun panta panw-katw (ws eniliki). Can never go wrong with an all black assemble, your new skinnies fit you just perfect! I like all in black! I am a huge black fan, and there was a time I always dressed in complete black, from head to toe! Right now I am wearing all black! So, I really loved your outfit and pictures, I think you look very very cool with the beanie as well! It’s like, I don’t know how to explain… mmm… that atmosphere of coolness, when people look at a person and think “wow”! You look stunning, in my opinion, do wear more black, it’s great! (But everything you wear is!) Makia! Wow! I didn’t know that about you! I could never imagine you as an all-black gal. You have such a colorful personality, and I know that you love color now, especially red, so it’s hard to imagine. hehe That’s so sweet, and cool! Thank you very much! It’s an “experiment” I’m definitely going to repeat. xixixi Mistiki praktoras e? Mou aresei! 🙂 S’euxaristw para poli glikia mou! Xairomai pou sas arese i idea tou total black. Auto to forema einai toooso zesto, pou ithela opwsdipote na to foresw san mplouza. An kai to exw ksanakanei sto parelthon, pro krisis, sigoura i krisi mas exei kanei na eimaste pio dimiourgikoi, otan den mporoume na agorazoume “sinexeia” kainourgia kommatia. An agoraseis tetoia mpotakia, me skopo na perpatas poli m’auta, prosexe poli ‘i na min einai toso psila, ‘i na exoun perissoteri platforma mprosta, giati ta dika mou sigoura den einai gia poli perpatima, prin ta sinithiseis. Kai sou milaei anthrwpos pou foraei sinexeia psilotakouna…Panemorfo papoutsi, alla den einai gia polles wres orthia, giati einai polla ekatosta sxedon xwris katholou pato mprosta. I am so into this outfit as well. Total black is always the safe yet chic choice and combined with suitable accessories they can be eye-catching! 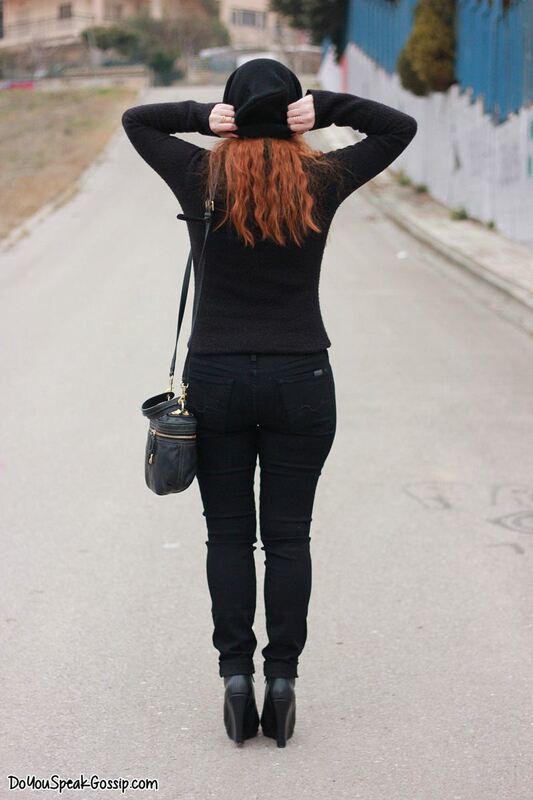 I also love the way that your red hair blends with this black outfit! Δεν το συνηθίζω το total black γιατί είμαι πολύ μελαχρινή με σχεδόν μαυρα μαλλια και ειμαι σαν την αδικη κατάρα όμως μου αρέσει πάρα πολύ!! Σου πάει!! Ωραία μποτάκια!! Evi recently posted..Current Obsession (of everyone else): Valentine’s Day. Wow I really like your heels! Thank you very much Saranda! Black is so elegant and timeless. You look lovely in this cool and relaxed look. Hats are indeed great way how to hide bad hair day and they can transform any outfit.